Like many long-anticipated sporting events for which athletes train rigorously, the annual Sunrise Ascent kicks off with a spaghetti supper the night before, running on equal parts carbs and excitement. And if participants are giddy at dinner, come 4 a.m. their enthusiasm is downright palpable. Among the 15 athletes at this year’s predawn starting line is 58-year-old Suzie “Soo-Soo” Coughlan, a former Montessori teacher from Maynard, Mass. She’s surrounded by a “blue sea of love,” as she calls her support team of 19, all dressed in turquoise T-shirts and bandanas, with a massive homespun flag at the ready. Soo-Soo has the spirit, the crew, and the experience. Only one thing distinguishes her from your typical athlete. She is battling Inclusion Body Myositis, an extremely rare degenerative disease with no cure. Another Ascenter, 19-year-old Sasha Segal, lives with a genetic condition, commonly called Sanfilippo Syndrome, that has claimed many of her cognitive and physical capabilities. And nearby, volunteers gather around Martin Wallem, a lifelong outdoorsman diagnosed with ALS 17 years ago, at age 31. Today he breathes through a ventilator and communicates with his eyes. Swaddled from head to toe, Wallem, who inspired the event, takes it all in. Soo-Soo, Sasha, and Martin are proven adaptive athletes. For them and for their families, the Sunrise Ascent is the year’s crescendo. Full of coffee, bagels, and gumption, they start their climb. Since 2009, Adaptive Sports Partners of the North Country (ASPNC), based in Franconia, N.H., has helped these three athletes and hundreds of others participate in outdoor activities. The Sunrise Ascent is the group’s annual summit, and while the event is planned as a 7.6-mile trek up the Mount Washington Auto Road, in years such as this one, rain or fog occasionally requires a detour to plan B: an 8-mile hike from Flume Gorge to the base of Cannon Mountain. Weather is a hazard familiar to all hikers in the White Mountains but not one that slows down this group. As she waits her turn at the starting line on August 6, Sasha’s eyes dart around, her face breaks into easy smiles, and her hands wave freely—all indicating her awareness that today holds something special. Founded in 2009, ASPNC is one of some 30-plus organizations in New England—including New Hampshire’s Northeast Passage, New York’s Adaptive Sports Foundation, and Rhode Island’s Sail to Prevail—that engage and assist adaptive athletes, loosely defined as those who have mobility impairments. In practice, athletes may range from someone with a prosthetic limb to someone who requires a trail rider: a contraption that’s a bit like a wheelbarrow, with one wheel or ski in front and two handles in back. The trail rider, in turn, is powered by a team of volunteers, called mules, who work in shifts to guide an athlete over terrain. One volunteer wears a harness and pulls from the front; two are stationed on either side for safety; and one to two people manage the rear bar. To avoid being perceived as solely a ski program, ASPNC launched before the snow began to fly, taking Wallem on an autumn hike to New Hampshire’s Bald Peak, in the Kinsmans. Wallem, whose movements are restricted to grinding his teeth and blinking his eyes, was able to hike, snowshoe, and downhill ski with volunteers. More than 120 ASPNC volunteers, staffers, and Plymouth State University doctoral students in physical therapy assist 200 adaptive athletes each year in an array of programs serving people of all abilities. There’s a power-wheelchair soccer team, a sled-hockey team, and a statewide Special Olympics team. There’s kayaking, swimming, fishing, mountain biking, rock climbing, tennis, basketball, alpine skiing, Nordic skiing, snowboarding, and snowshoeing—the latter often leaving from AMC’s Highland Center at Crawford Notch. Participation fees for athletes average around $25 per session for a six- to eight-week course, with a sliding scale available. 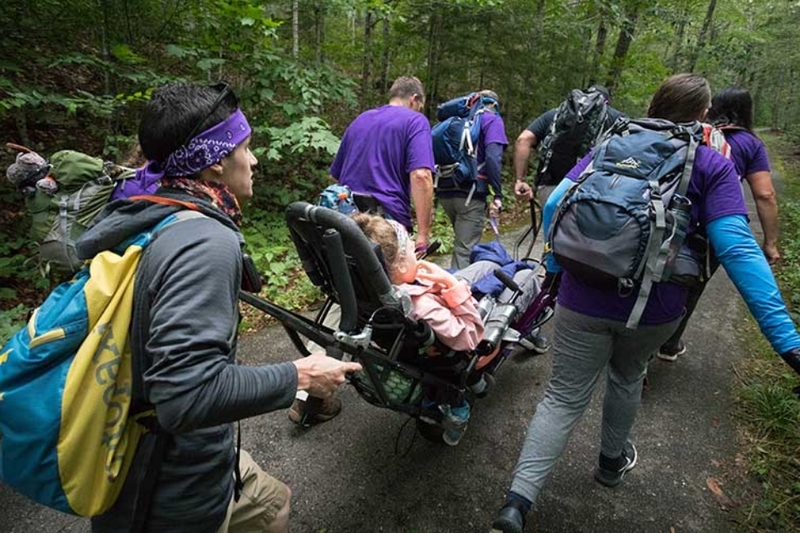 “AMC’s mission and commitment to ensuring outdoor access for all means supporting organizations such as Adaptive Sports Partners,” says Chris Thayer, AMC’s director of North Country programs and outreach. Sasha Segal also has benefited from ASPNC. Ten years ago, her parents, Mike and Joanne Huff, moved from Los Angeles back to Joanne’s native New Hampshire. It was there they discovered Sasha’s love of the outdoors, specifically trees. For years, Sasha’s behavior was “pretty wild,” Joanne says. Hyperactivity is common as Sanfilippo Syndrome progresses, and when it grew difficult to harness Sasha’s energy, her safety, especially in recreational settings, became an issue. Then, three years ago, Joanne heard about ASPNC. She called Olney to learn more and soon found herself in a comprehensive dialogue, reporting not only on Sasha’s developmental, cognitive, and postural states but also on what she and Mike hoped Sasha would get out of ASPNC. Sasha’s needs are some of the most profound among ASPNC athletes. Because she doesn’t have control over her limbs, her trail rider must prevent her from extending her arms; her legs are gently strapped; and a U-shaped rest keeps her feet from dropping to the ground. “Some people need a little bit more; others need less,” Joanne says. Soo-Soo Coughlan relishes the freedom ASPNC has given her. Over the last three years, the one-time all-around athlete and elite skier has become acutely aware how many activities her body can no longer handle on its own. “When I was first introduced to adaptive skiing, I found the idea of going down the slope in a toboggan horrifying,” she says. At the closing ceremony of this year’s Sunrise Ascent, when all of the awards have been distributed and some tears shed, Soo-Soo makes her way over to Martin, to thank him for helping initiate this deeply meaningful event so many years ago. Having heard he’s competitive about the fundraising component, she feels the need to apologize for stealing the wind from his sails: Her team raised $22,000, an unprecedented accomplishment. With Cara aiding the conversation, the two athletes agree everyone’s a winner. Perhaps the words painted on Team Soo-Soo’s flag best express the sentiment at the hearts of all present. Staked at the hike’s end, it waves its message: Powered by Optimism. Monday Milers, a weekly walking group, meets 9:30 a.m. Mondays year-round at various locations. Participation is free and open to all, but preregistration is required. Call 603-823-5232 or e-mail info@adaptivesportspartners.org. Winter Basics Training for Volunteers, an indoor workshop, is scheduled for 10 a.m. November 11 at AMC’s Highland Center. Also for volunteers, Winter Venue Training begins at 10 a.m. on December 17, with Snowshoe Venue Orientation following at 12:30 p.m., both at the Highland Center. See the calendar at Adaptive Sports Partners for details. Cannon Mountain Ski Area is partnering with ASPNC to offer reservations for adaptive skiing 10 to 11:30 a.m. daily, December 26 through January 1. See the calendar for details. Looking to volunteer with ASPNC? Find information for both adults and youth. Athletes or family members interested in ASPNC’s services can read more. Not based in New Hampshire? For dozens of other adaptive athletics programs in the Northeast, visit Adaptive Sports New England. Read about two other groups that have used AMC lodges as base camps at outdoors.org/warriorhike and outdoors.org/woundedwarrior. Find outings for all ability levels. Kiley Jacques is a freelance writer based near New Hampshire's Mount Monadnock. Her brother, Kevin, has recently joined the ranks of adaptive athletes, a community she wrote about in AMC Outdoors' Nov/Dec 2017 issue.